Come one, come all. 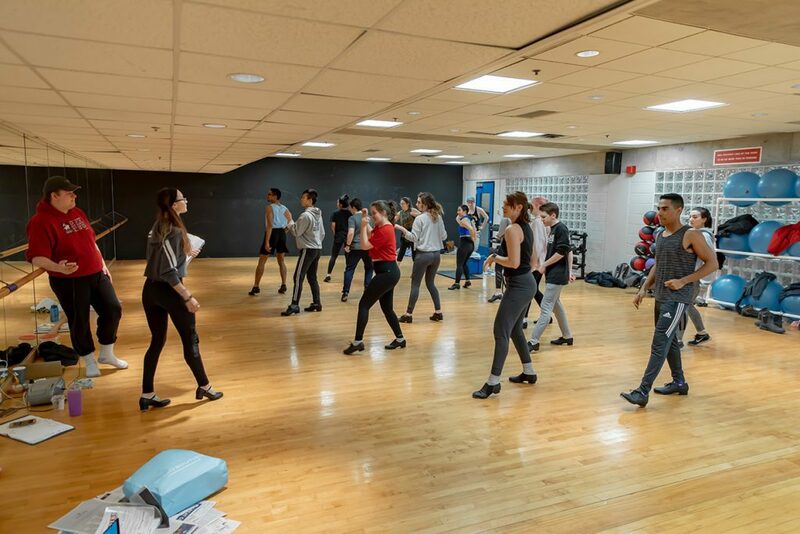 Ryerson Musical Theatre Company welcomes all students. It’s 10 a.m. on a Sunday and the sounds of show tunes and laughter echo down the hallway of the lower-level of the RAC. The door to studio one is wide open, an inviting aura emanating from the room. A pile of boots and running shoes sit in a contained mess by the door, while backpacks, jackets, water bottles and binders of sheet music litter the left corner of the room. 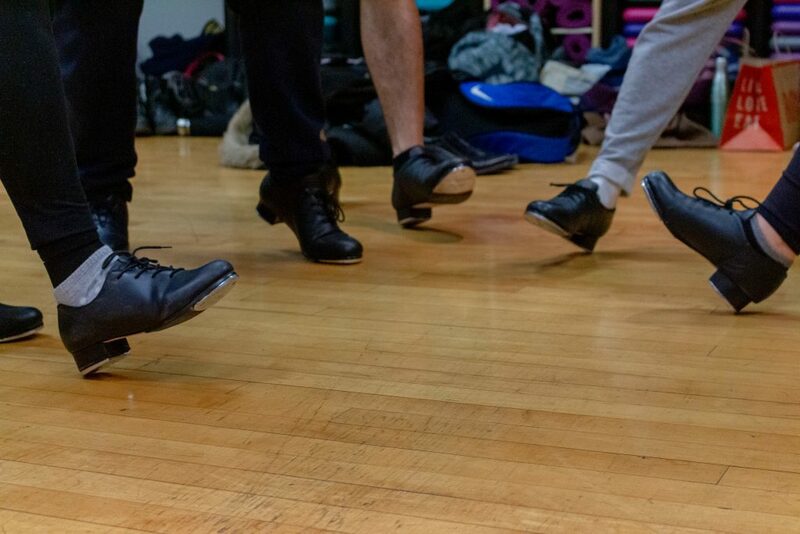 Over 20 students wearing tap shoes stand in their assigned positions, waiting for instruction from the choreographer. They fidget in their spots, practising their toe and heel taps and shuffles. King of New York from the original Disney’s Newsies begins to play on a CD and within seconds, the group becomes animated, taking on their destined role as newsies. They effortlessly move as a unit, with each person getting their own moment to shine with a tap solo. This is a typical Sunday for members of the Ryerson Musical Theatre Company (RMTC). Upon first glance, you’d think these were theatre students, but this isn’t the case. RMTC is made up of students from all areas of study, from sociology and early childhood studies to film and sport media. 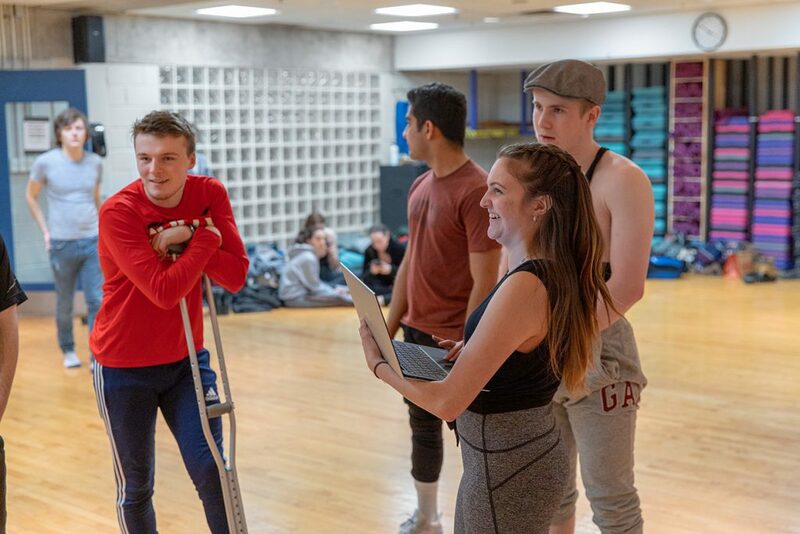 As the majority of the cast rehearses the King of New York dance number, Darling, who plays Crutchie, waits on the sidelines, practising his limp and getting used to walking around with a crutch – as he’s never used one before. As the name suggests, the crutch is a key prop for his character. 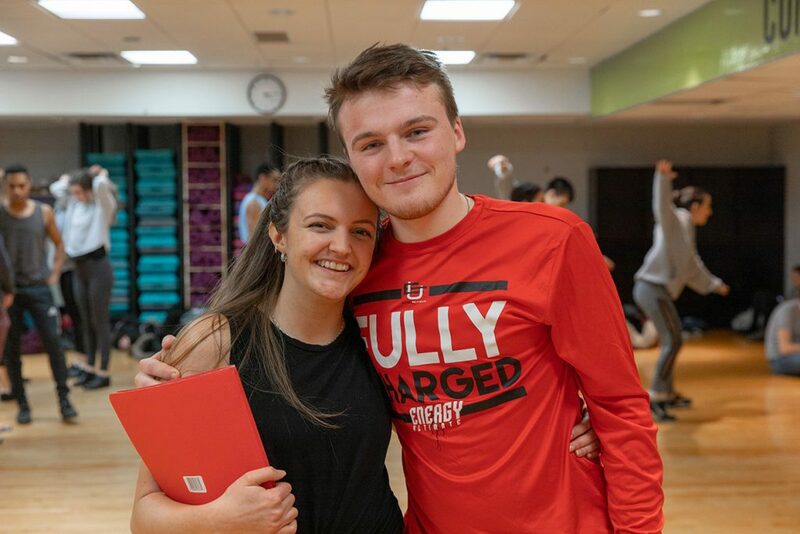 Darling is a second-year sport media student at Ryerson University and this show marks his first time acting in an RMTC production. This is the RMTC’s fourth year putting on a show. Its past productions include Thoroughly Modern Millie, The Drowsy Chaperone, and Into the Woods. This year’s production of Newsies is based on the 1899 newsboys strike in New York City. The musical follows Jack Kelly, a charismatic newspaper delivery boy and leader of a band of teenage newsies, many of whom are homeless and orphaned. As the publishing titans increase distribution prices at the newsboys’ expense, Kelly rallies with other newsies across the city to go on strike against the unfair conditions and fight for what they know is right. 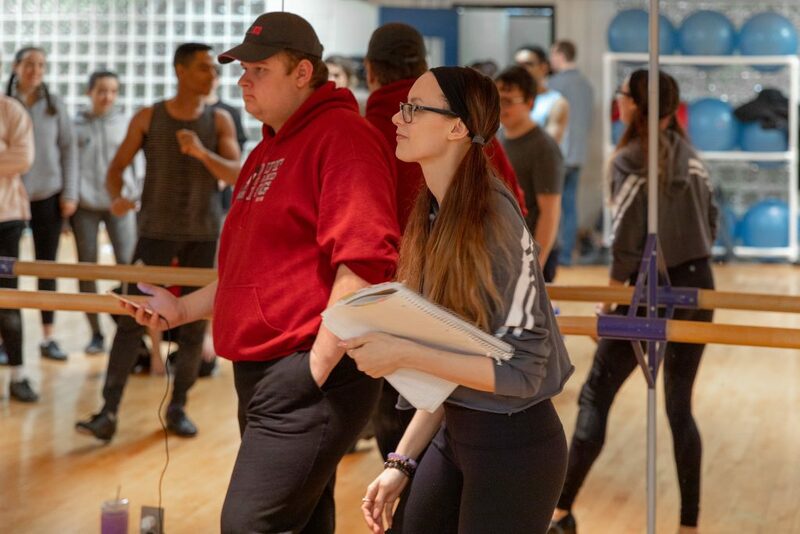 Isabella Verrilli, a third-year creative industries student and the director of Newsies, stands at the front of the studio with the script for the show in hand. She begins blocking the big fight scene, directing the cast members to stand in certain positions. She walks up to Darling and directs him to fall to the ground after a staged fight sequence with two other cast members. 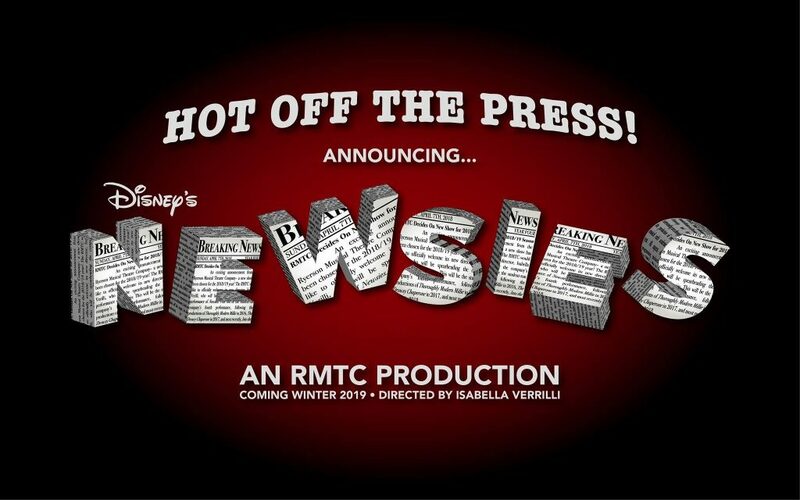 Verrilli draws many parallels between Newsies and the group of students involved with RMTC. The RMTC functions as a theatre company with three layers: an executive team that deals with finances and marketing, a creative and production team that deals with directing, choreographing and providing music, sets, and costumes for the show, as well as the cast who bring the characters and the dance routines to life. The group was started out of a desire to have a musical theatre outlet for students from all programs and faculties. Verrilli says there are many aspects to putting on a show like Newsies, which is why she thinks students with diverse interests should join. “You don’t even necessarily have to act, you can be a director, you can do finances, it’s just all about running a cohesive theatre company,” said Darling. Darling says the main reason why he joined RMTC was to continue a passion he had from high school. Darling isn’t alone in this. 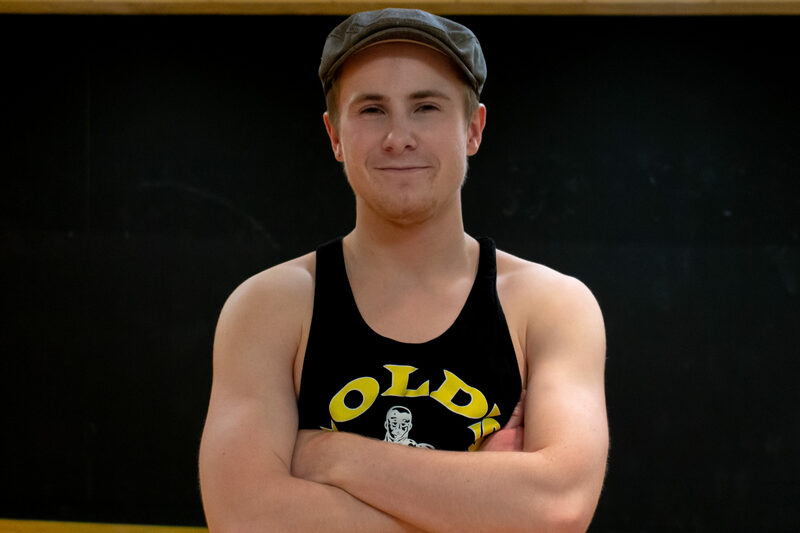 Mark McKelvie, a third-year journalism student, took part in several community productions in his hometown of Sarnia, Ont. He took a musical theatre course at Ryerson last year and developed a passion for musicals. This made him want to audition for Newsies, in which he landed the lead role of Jack Kelly. McKelvie has since taken an interest in pursuing more theatre opportunities. 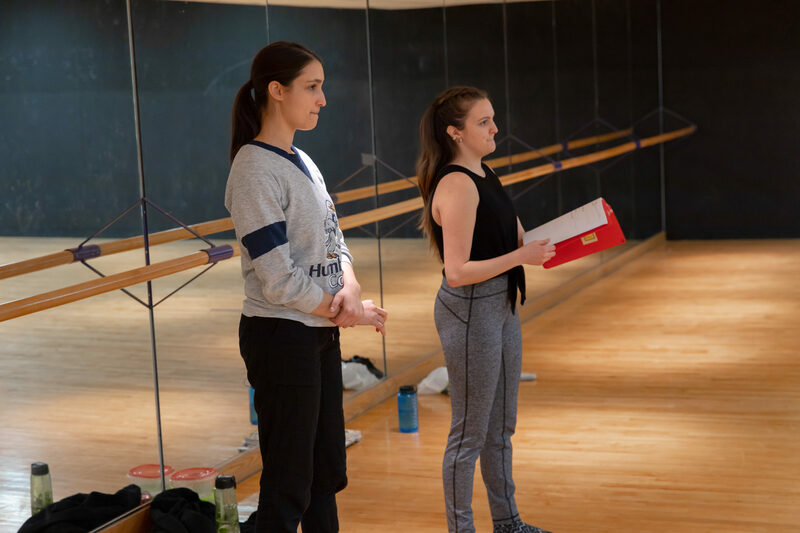 As the cast goes over the choreography for the King of New York number, McKelvie sits at the front of the room, reviewing the sheet music for another musical he is in. McKelvie said having little experience in theatre shouldn’t deter people from joining. Kanga leads a vocal warmup, instructing the cast to do lip trills and octave slides in which they must sing “oh” or “oo” from their lowest comfortable note to their highest comfortable note. Kanga then claps along to keep the beat while the cast sings Once and For All. She yells out “no harmony” and “save your voices” while they belt out the lyrics. Kanga, a third-year creative industries student, says she loves when “newbies” join RMTC. Verrilli says that only about three people in the King of New York tap number actually knew how to tap dance. The rest learned at rehearsals for the show. During their breaks, the group of 30-something cast and creative team members sit together in a circle on the studio floor, sharing inside jokes and swapping stories about their weekends. After the break, Zoe Choptain stands at the front of the dance studio, facing the mirror. 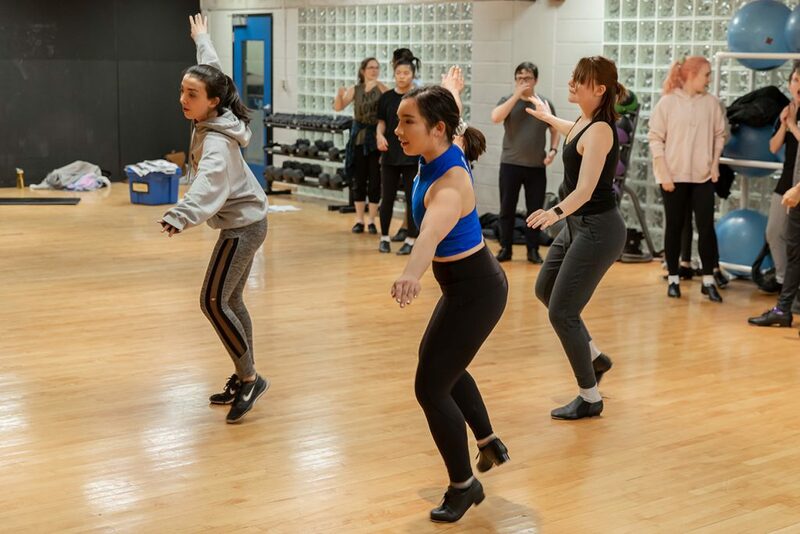 As the choreographer for Newsies, she demonstrates how to do paradiddles (a common tap dancing move) in the King of New York number, yelling out that the cast is missing the “heel sound.” She sounds out “paradiddle,” matching the syllables of the word with her taps. Like Verrilli, Choptain says she is proud of how far the cast has come. 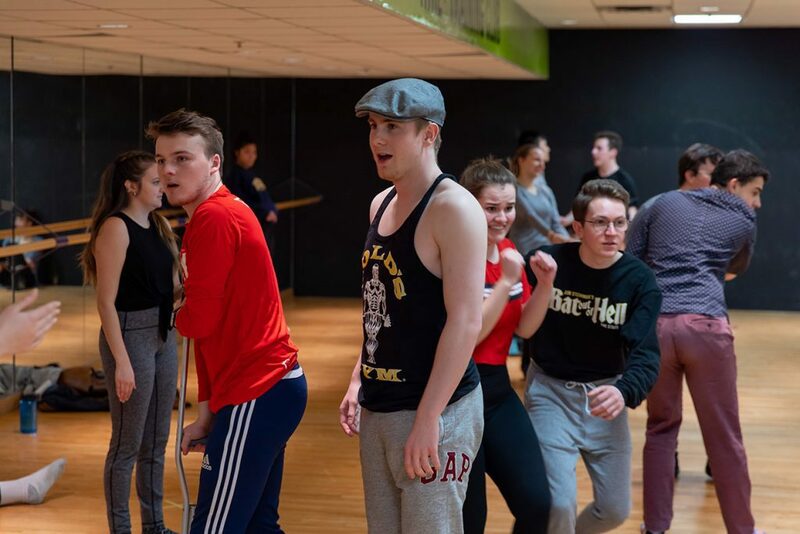 The group is hoping to be performance ready for their show run from March 13 to 16 at the Al Green Theatre. For the show’s big tap number, Choptain wanted to show each cast member’s individuality, beyond the fact that they’re all in different programs. “We really wanted to focus on making sure that everybody had solo moments, so everyone has a little bit of a moment where they get to shine even if it’s a small group or a little bit of a solo so that their characters aren’t just a newsie,” she said. 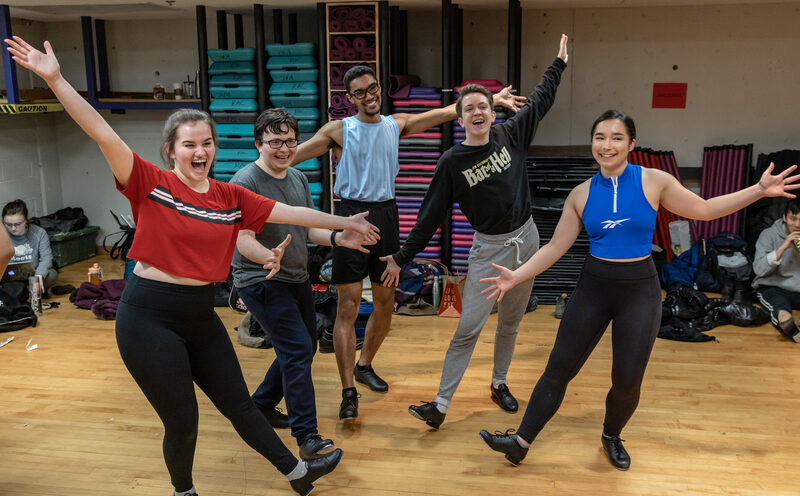 One thing that this eclectic group of students has in common is that they all believe the people involved with RMTC is what makes the whole process worth it. They even get together outside of their rehearsals, according to Choptain. She says that she’s made a lot of friends through RMTC. Kanga agrees that RMTC is a great way to meet people. Darling appreciates that RMTC gives him the opportunity to interact with upper-years who can give him advice. In the remaining hours of the rehearsal, the group runs through all of the scenes and musical numbers they practised. Tired and drained, the students give their last bout of energy in their final song of the day. Their voices fill with passion and their dance moves are precise. As the song comes to an end, Verrilli, Choptain and Kanga let out cheers of encouragement and call a group meeting. The cast sits in the centre of the studio floor, listening eagerly as the creative execs share their notes on what needs to be improved on and what the goals are for the next rehearsal. As the clock hits 5 p.m., the fun comes to an end. In small groups, the students make their way out of the studio, laughing and talking about their plans for the evening. The studio lights fade to black. But the show isn’t over yet. They’re going to do it all again next Sunday.